On Russia and Putin, @HillaryClinton tells me @OnPointRadio : "The reset worked." Russian media have been poking fun at the US secretary of state over a translation error on a gift she presented to her Russian counterpart. 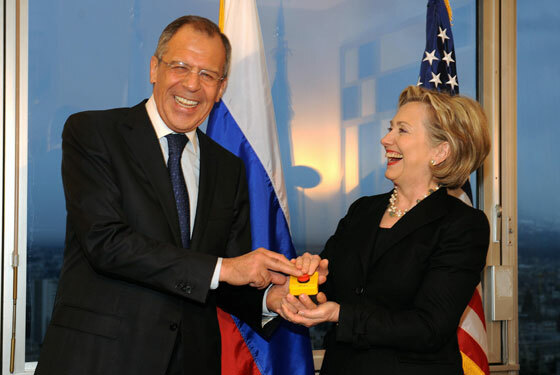 Hillary Clinton gave Sergei Lavrov a mock "reset" button, symbolising US hopes to mend frayed ties with Moscow. But he said the word the Americans chose, "peregruzka", meant "overloaded" or "overcharged", rather than "reset". The only way to do it is to argue that it was a success but that, through no fault of Hillary’s own, of course, it collapsed in a heap. Officially, she’s going to blame the failure of the reset on Putin re-assuming the presidency after four years of Medvedev, but that makes no sense. As Hillary herself concedes (“of course Putin still pulled the strings”), Putin was calling the shots as prime minister during Obama’s first term while Medvedev kept his presidential seat warm. Russian law forbids more than two consecutive terms as president — for now — so Czar Vladimir temporarily stepped aside for a catspaw. She’s drawing a lame distinction between Medvedev and Putin simply as an excuse for why her biggest initiative as Secretary of State now lies in ruins. Unofficially, of course, she’s also drawing a tacit contrast between herself and Obama: Things with Russia were fine during his first term but once she left State, everything went to hell. 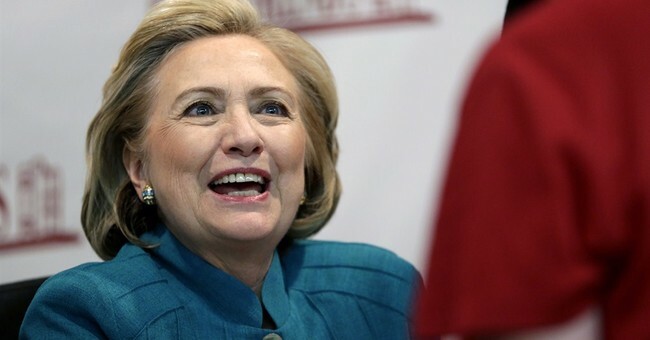 If having Putin as president of Russia is the key to all this, I’m not sure why we should expect different foreign policy results from President Hillary; after all, Putin will still be czar or king or emperor two years from now. But you’re not supposed to think too hard about this. "Don't think too hard" might as well be an early frontrunner for her 2016 campaign-in-waiting's slogan. She's going to ask voters to give her political credit for all of the good things that happened during her husband's presidency and the Obama administration, while absolving her of the negative developments. She'll cherry-pick all day and all night. Clinton economy? Let's bring it back. The Obamacare mess? I would have done it more effectively. Etc, etc. But until she formally throws her hat in the ring, we'll have to endure an exhausting parade of coy hints, and an increasingly steady diet of the 'First Woman President' narrative.